Hybrid pixel-waveform CdTe/CZT detector for use in an ultrahigh resolution MRI compatible SPECT system_News_SiC Wafer,GaN Wafer,GaAs Wafer,Ge Wafer--XIAMEN POWERWAY ADVANCED MATERIAL CO.,LTD. In this paper, we will present a new small pixel CdTe/CZT detector for sub-500 μm resolution SPECT imaging application inside MR scanner based on a recently developed hybrid pixel-waveform (HPWF) readout circuitry. The HPWF readout system consists of a 2-D multi-pixel circuitry attached to the anode pixels to provide the X–Y positions of interactions, and a high-speed digitizer to read out the pulse-waveform induced on the cathode. The digitized cathode waveform could provide energy deposition information, precise timing and depth-of-interaction information for gamma ray interactions. Several attractive features with this HPWF detector system will be discussed in this paper. To demonstrate the performance, we constructed several prototype HPWF detectors with pixelated CZT and CdTe detectors of 2–5 mm thicknesses, connected to a prototype readout system consisting of energy-resolved photon-counting ASIC for readout anode pixels and an Agilent high-speed digitizer for digitizing the cathode signals. The performances of these detectors based on HPWF are discussed in this paper. Fig. 1. 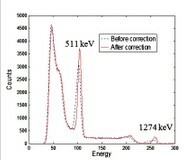 Na-22 energy spectra measured with sampled cathode waveforms, the correction represents the hole trapping compensation with different DOI.